Or 6 weekly interest-free payments from $6.16NZD What's this? Super Fruit Skin Brightening Facial Tonic is a true skin treatment product. It's a highly effective daily treatment for brightening dull, tired skin, regardless of age. It's a unique formulation that combines powerful and innovative natural ingredients with potent vitamin C to visibly brighten, hydrate and help protect and repair skin against damage caused by UV light exposure and pollution. 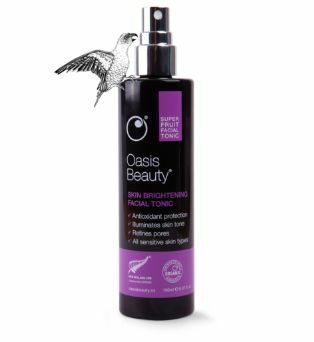 Active ingredients include Pepperberry which reduces the appearance of skin redness and is clinically proven to reduce inflammation. Australian wild berries such as Riberry and Muntries are rich in antioxidants and stimulate production of hyaluronic acid. Whilst Kakadu Plum, the richest natural source of vitamin C provides optimal levels of bio active vitamin C to protect against environmental stress and help repair sun damaged skin. The very high concentration of antioxidants in Super Fruit Facial Tonic provide immediate and long-lasting repair of free radical damage. When skin cells are functioning properly, the skin appears fresh, bright and dewy. 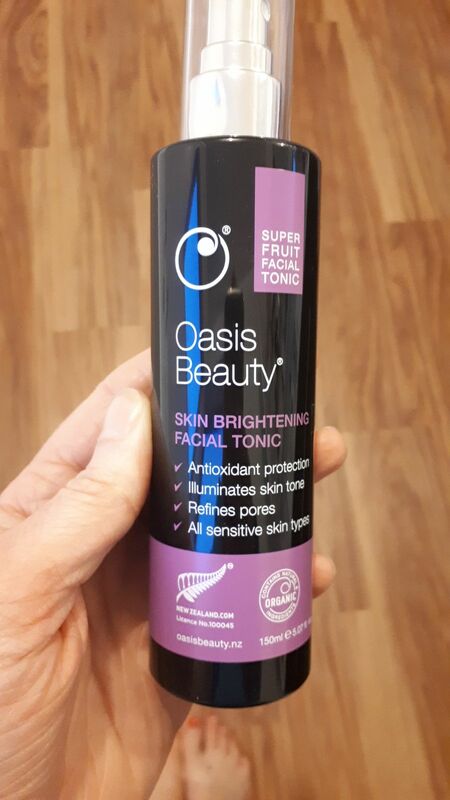 Super Fruit Skin Brightening Facial Tonic is versatile, easy to use and packed full of nutritious skin elements to aid your anti-ageing programme. There are two ways to apply Super Fruit Skin Brightening Facial Tonic. We prefer to spray it onto a cotton wool pad (can be damp) and sweep over face and neck after cleansing. This guarantees the skin is comprehensively covered with the tonic and picks up any remaining debris after cleansing to ensure the skin is perfectly clean before moving to the next steps in your skin care programme. Others prefer to simply spritz directly onto skin after cleansing or any time during the day to refresh and hydrate. Keep in the fridge during summer for a cooling and refreshing natural facial spritz when your skin heats up. Spray onto cotton wool pads or buds to easily clean up fall-out under the eye area and to create a defined wing edge after eyeshadow application. ♜ Australian Kakadu Plum was found in recent studies to be an extremely good source of antioxidants with Vitamin C levels per gram of fruit more than 900 times higher than blueberries! ♛ Pepperberry is rich in antioxidants (anthocyanins and rutin) protecting cells from oxidative damage. Rutin is known to strengthen capillaries having a great impact on reducing the appearance of dark circles. It also contains polygodial, an antimicrobial and anti-inflammatory agent. ♟Riberry contains antioxidants (vitamin E and anthocyanins) and nutritious skin elements like essential minerals (magnesium, calcium, potassium). ♞ Muntries are rich in anthocyanins, mostly in cyanidin 3-glucoside. The high natural wax content found in the berry nourishes the skin and provides a barrier against moisture loss. Johanna H. Reviewed by Johanna H.
Love this toner. My pores look less noticable and my skin condition looks improved. Will forever buy this toner. I use it morning and night by soaking a cotton ball (after cleansing) and it is amazing how much dirt shows up on the cotton ball - shows how important this step is. Sarah B. Reviewed by Sarah B.
I love this product - makes my skin feel, look and smell great! Tanya H. Reviewed by Tanya H.
Kate C. Reviewed by Kate C.
luca B. Reviewed by luca B. It is so good and smells amazing! I have noticed over the past few weeks improvements in my skin and I will definitely be getting this again.